Looking to get your business on Instagram? Know what seven mistakes you should avoid when it comes to your Instagram marketing efforts. At first glance, Instagram may seem like just a feed of endless photos, but it’s really a social media platform full of opportunities to build engagement with your consumers. Before you begin to establish your Instagram community and build your brand, here are seven mistakes you need to avoid making on your Instagram account. Instagram is an online mobile photo sharing and video sharing social network. In case you didn’t notice, I placed an emphasis on the word “sharing” because the point of every social network is to share your thoughts and ideas with an online community. Setting your business account to private is limiting your opportunity to connect with unknown markets and making it harder for your consumers to connect with you. Making your business’s account public is the only way for new audiences to find and connect with you. Your Instagram account, like any social media platform, should serve a certain purpose, and every post should be written with a goal in mind. The purpose of Instagram is to visually tell a story and draw people in to learn more. Human beings have been storytellers since the dawn of time and eat content with their eyes. With Instagram’s photo and 15-second video sharing capabilities, it allows you to tell captivating stories about your business in the perfect amount of time for your audience to consume. This platform allows you to share stories about the success of your business or reveal a piece of your company culture. 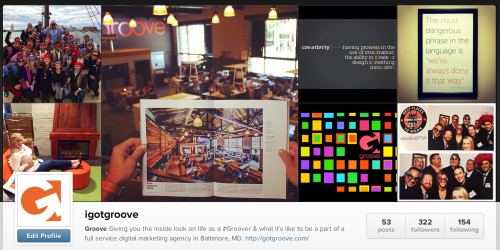 A good example would be the video we made to announce Groove winning Baltimore's 2014 Best Places to Work Award. With music and a few different shots, we made a short yet engaging video recapping this event. It was not only able to capture the suspense and excitement that we went through as a company, but it also shared a fact about our company in a creative way. There can be such an occurrence as “too much of a good thing,” and while some people will post every minute of an event on Instagram or the same selfie with a three different filters, that does not mean you should do it too. It’s important to keep your content spread out as well as to have a variety when it comes to posts. Instagram is a balancing act between providing enough posts to keep your followers’ attention, but not frequently enough that it comes off as spammy and you start to lose followers. Just remember that quality always trumps quantity. Posting relevant, original content will keep your audience engaged and attract more ideal followers for you. It’s great that you are sharing excellent content, but now that your audience is engaging it’s time you engage back. When your followers reach out to you, it’s crucial to interact with them. It’s such an awesome feeling to see someone has commented on your post, so return the favor and respond to his or her comment. After all, social media is about a dialogue, not a monologue. It upsets me when I see great content on Instagram without any hashtags because I think of the powerful engagement it could have gotten with the use of the right hashtags. Hashtags on both Instagram and Twitter serve the purpose of grouping relevant content and conversations together. They help spread your posts to places where your communities and consumers will better find them. The same goes with geo-tagging your images. For example, when launching an event like an open house, an event hashtag allows people to have clickable resource to find a variety of posts from the event. It allows people to follow the conversation online. Continue the conversation past your followers and use proper, relevant hashtags as well as location tagging. Keep in mind you can always search hashtags on Instagram to see any existing ones that may be helpful in spreading your message. Make sure to follow those who follow you. If the number of people following you is ten times larger than the amount you are following, it indicates you aren’t trying to get to know your following. It’s important to know what your consumers are looking for and are interested in to better meet their needs. Instagram is a useful tool in announcing upcoming promotions for your business, but it’s the perfect platform to show off all aspects of your business—from making products to the unique staff. Since Instagram is more of a show-and-don’t-tell platform, this is a great place to show what your organization stands for and is about. Instagram allows you to showcase your business and helps establish how it stands out compared to your competitors. Overall, remember that people like talking to people, so make sure your business shows off the people that make your brand. If you keep these seven Instagram marketing no-nos in mind when creating an Instagram account for your business, you will get on the right track for creating a beneficial community for your business and your followers. Looking for more ways to build your brand over social media platforms? 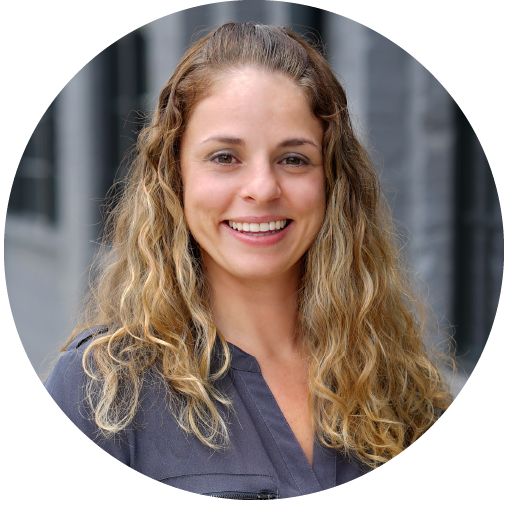 Are you looking for a marketing team to help you with your social media strategy? Contact us today! We'd love to work with you.